There has been a great upheaval in physics over the last century. In The Trouble with Physics Lee Smolin argues that this revolution still has some way to go. In the first chapter he identifies five major problems of physics which need addressing. The main problems concern the unification of the different parts of physics - unified laws for quantum gravity and a unified view of the stuff which the universe is made of, but there are also the problems of the weirdness of quantum theory, of why the parameters of physics have the values they do, and of the nature of the dark matter and dark energy which comprises most of the universe. So how is theoretical physics doing - what has been achieved in the last quarter of a century? Well, plenty, if you like mathematically sophisticated theories, but if you want something that can be experimentally tested then the progress has not been as impressive - Smolin argues that there have been hardly any experimental results which can't be explained by the Standard Model of particle physics, which was in place by the 1970's (Hopefully this will change when the Large Hadron Collider starts producing results next year). So how is theoretical physics to progress? In the past physicists have found the elegance of a theory to be a strong indicator of its usefulness but Smolin argues that this preference may be leading physics in the wrong direction. 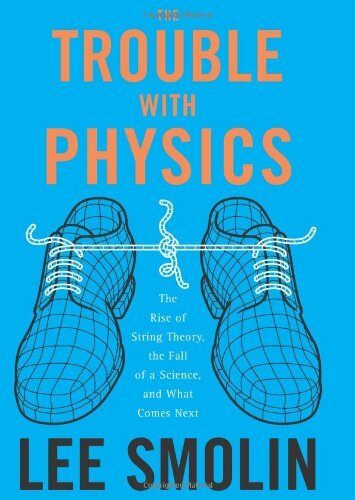 Smolin sees string theory as the chief culprit in the misdirection of physics. The second part of the book gives a history of this subject, starting with its origin in the 1970's and going on to look at the revolutions of the 1980's and the 1990's which made string theory into the hot topic it is today. Part of the reason for this popularity was that the theory promised an explanation for the why the parameters of physics - the masses of elementary particles and such - have the values which they do. Smolin argues that this promise has not been fulfilled. Instead we have the landscape problem - a huge number of possible universes, from which we have to find some reason - such as the anthropic principle - which explains why we live in our particular universe. Another unfulfilled promise of string theory is that of finiteness. Although the move from point particles to strings supposedly eliminates the infinities which plague other theories of quantum gravity, Smolin explains that this has not been fully proved. Hence he feels that theoretical physicists should be moving away from string theory, and that it certainly shouldn't enjoy the popularity which it now has. In the third part of the book Smolin describes some of the areas of research in which he has worked. One chapter looks at alternatives to string theory, and in particular theories of quantum gravity which are background independent - where space and time are not taken as given, but may be built up from more fundamental entities. But his challenges are to more of physics than just string theory. Smolin explains how anomalies in the motion of the Pioneer spacecraft may be linked with the rotation curves of galaxies to suggest that our theories of gravity on a large scale need revising - MOND (Modified Newtownian dynamics) rather than General Relativity plus dark matter and dark energy. He also discusses challenges to special relativity - experimentally from the results of cosmic ray detectors, and theoretically from the absolute nature of the Planck length, leading to a theory known as Doubly Special Relativity. The final part of the book is likely to be the most controversial. Here Smolin widens the discussion, indicating that the problem isn't just about theories of quantum gravity, but pervades the whole of academic science. He claims that scientific research has become too rigid, with the more imaginative ideas being suppressed by the policies of funding bodies. He makes a good case, arguing that some of the most important results come from outside of the mainstream - Einstein is the classic example. He also tells of how his own career was influenced by Feyerabend's book Against Method. There is more on this aspect of the discussion in my report of the Oxford debate in which Smolin took part. I couldn't help wondering whether Smolin had really thought out how his hopes for encouraging more diversity in scientific research would work in practice - how he would avoid an 'anything goes' scenario in which it would be hard to tell what research was to be taken seriously.